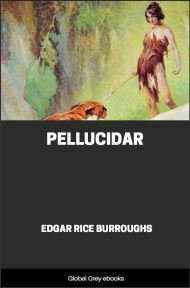 Pellucidar is a 1915 fantasy novel by Edgar Rice Burroughs, the second in his series about the fictional "hollow earth" land of Pellucidar. 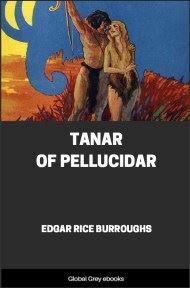 David Innes and his captive, a member of the reptilian Mahar master race of the interior world of Pellucidar, return from the surface world in the Iron Mole invented by his friend and companion in adventure Abner Perry. 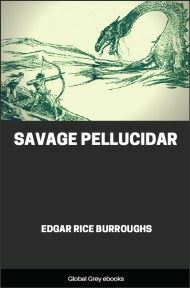 Emerging in Pellucidar at an unknown location, David frees his captive. He names the place Greenwich and uses the technology he has brought to begin the systematic exploration and mapping of the unknown land while searching for his lost companions, Abner, Ghak, and Dian the Beautiful. 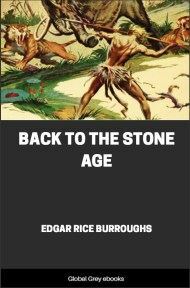 The Arabs, of whom I wrote you at the end of my last letter (Innes began), and whom I thought to be enemies intent only upon murdering me, proved to be exceedingly friendly—they were searching for the very band of marauders that had threatened my existence. The huge rhamphorhynchus-like reptile that I had brought back with me from the inner world—the ugly Mahar that Hooja the Sly One had substituted for my dear Dian at the moment of my departure—filled them with wonder and with awe. With their help I managed to get the unwieldy tons of its great bulk into a vertical position—the nose deep in a hole we had dug in the sand and the rest of it supported by the trunks of date-palms cut for the purpose. It was a mighty engineering job with only wild Arabs and their wilder mounts to do the work of an electric crane—but finally it was completed, and I was ready for departure. For some time I hesitated to take the Mahar back with me. She had been docile and quiet ever since she had discovered herself virtually a prisoner aboard the "iron mole." It had been, of course, impossible for me to communicate with her since she had no auditory organs and I no knowledge of her fourth-dimension, sixth-sense method of communication. 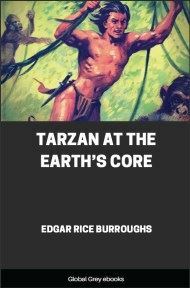 The aspect of the surrounding country was entirely unfamiliar to me—I had no conception of precisely where I was upon the one hundred and twenty-four million square miles of Pellucidar's vast land surface. The perpetual midday sun poured down its torrid rays from zenith, as it had done since the beginning of Pellucidarian time—as it would continue to do to the end of it. Before me, across the wide sea, the weird, horizonless seascape folded gently upward to meet the sky until it lost itself to view in the azure depths of distance far above the level of my eyes. How strange it looked! 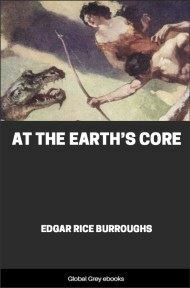 How vastly different from the flat and puny area of the circumscribed vision of the dweller upon the outer crust! I was lost. Though I wandered ceaselessly throughout a lifetime, I might never discover the whereabouts of my former friends of this strange and savage world. Never again might I see dear old Perry, nor Ghak the Hairy One, nor Dacor the Strong One, nor that other infinitely precious one—my sweet and noble mate, Dian the Beautiful! 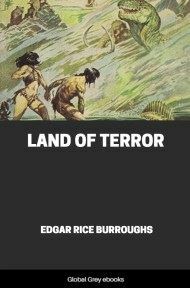 But even so I was glad to tread once more the surface of Pellucidar. Mysterious and terrible, grotesque and savage though she is in many of her aspects, I can not but love her. Her very savagery appealed to me, for it is the savagery of unspoiled Nature.